Our knowledgeable techs can help you get up and running with Nagios XI fast. Let us help you deploy Nagios XI with a remote-assist or quickstart that’s designed to save you time and get you off on the right foot. Provides monitoring of all mission-critical infrastructure components including applications, services, operating systems, network protocols, systems metrics, and network infrastructure. Hundreds of third-party addons provide for monitoring of virtually all in-house applications, services, and systems. 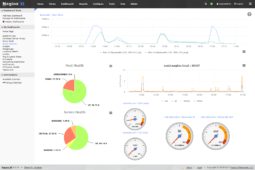 The powerful Nagios Core 4 monitoring engine provides users with the highest degree of monitoring server performance. High-efficiency worker processes allow for nearly limitless scalability and monitoring effectiveness. 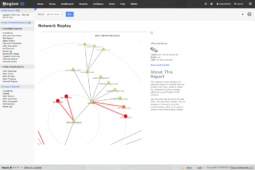 Provides a central view of your entire IT operations network and business processes. 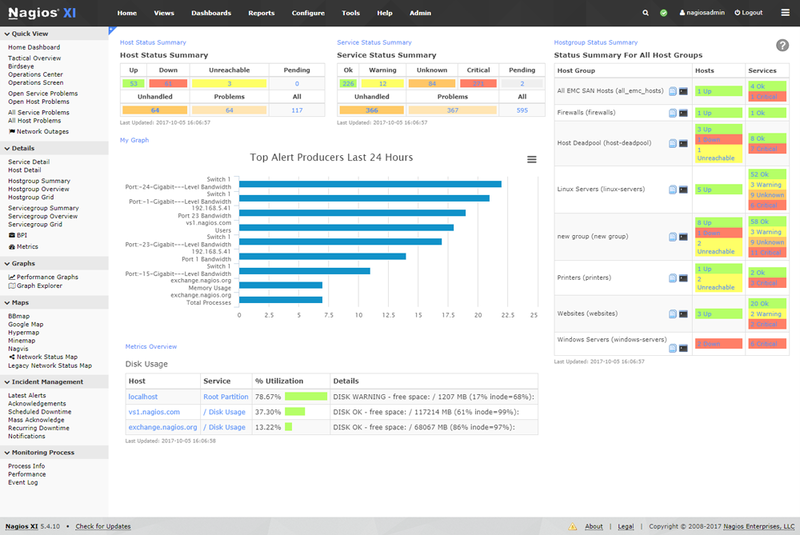 Powerful dashboards provide at-a-glance access to powerful monitoring information and third-party data. Views provide users with quick access to the information they find most useful. Automated, integrated trending and capacity planning graphs allow organizations to plan for infrastructure upgrades before outdated systems catch them by surprise. Alerts are sent to IT staff, business stakeholders, and end-users via email or mobile text messages, providing them with outage details so they can start resolving issues immediately. A powerful GUI provides for customization of layout, design, and preferences on a per-user basis, giving your customers and team members the flexibility they want. Integrated web-based configuration interface lets admins hand out control of managing monitoring configuration, system settings, and more to end-users and team members easily. Configuration wizards guide users through the process of monitoring new devices, services, and applications – all without having to understand complex monitoring concepts. Multi-user access to web interface allows stakeholders to view relevant infrastructure status. User-specific views ensure clients only see the infrastructure components they’re authorized for. 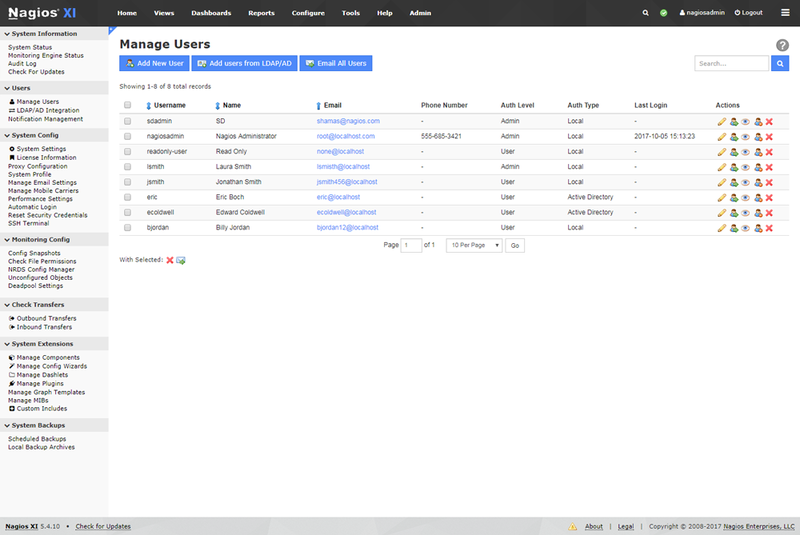 Advanced user management simplifies administration by allowing you to manage user accounts easily. Provision new user accounts with a few clicks and users automatically receive an email with their login credentials. 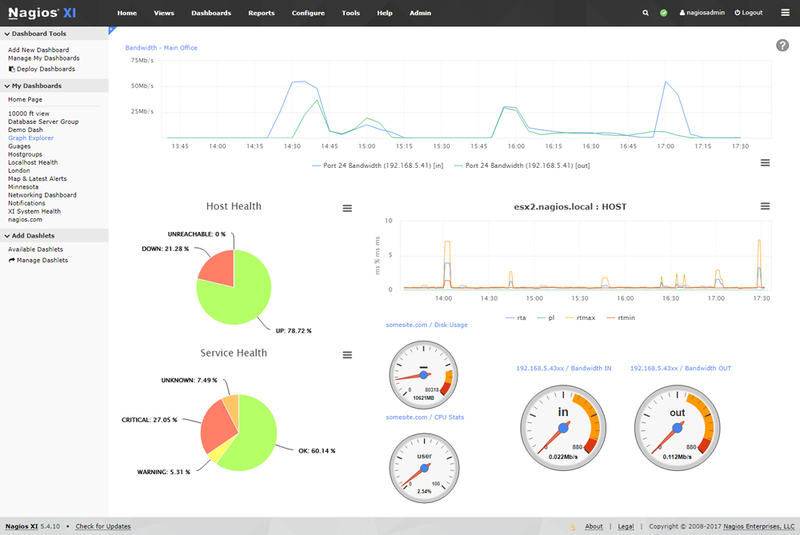 Powerful Monitoring Engine Nagios XI uses the powerful Nagios Core 4 monitoring engine to provide users with efficient, scalable monitoring. 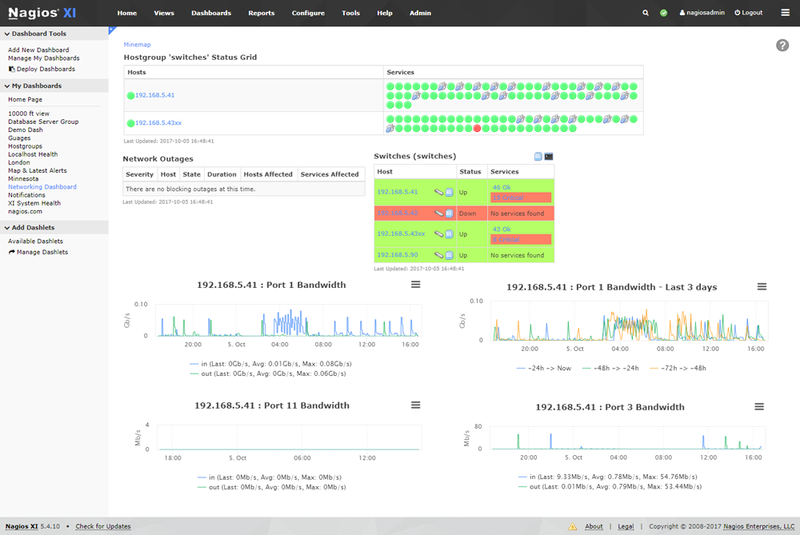 Updated Web Interface Your new dashboard provides a customizable high-level overview of hosts, services, and network devices. 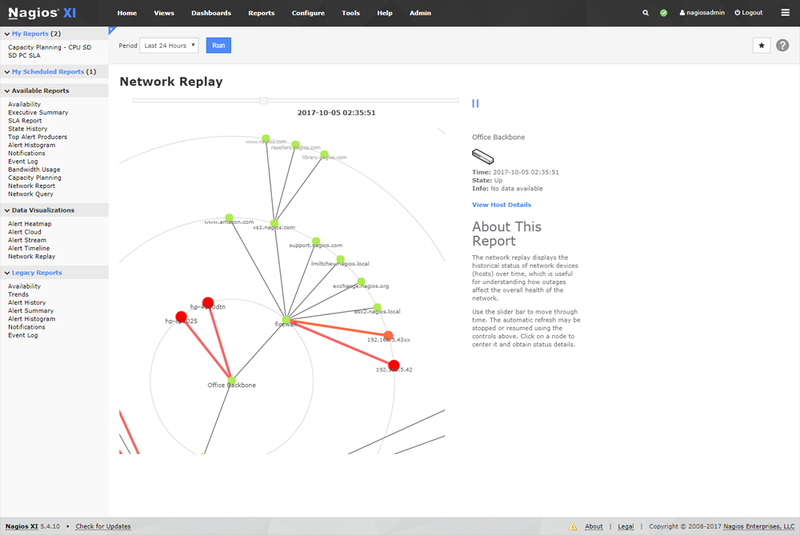 Advanced Graphs & More Administrators can easily view network incidents and resolve them before they become major catastrophes. Capacity Planning Automated, integrated trending and capacity planning graphs allow organizations to plan for upgrades. 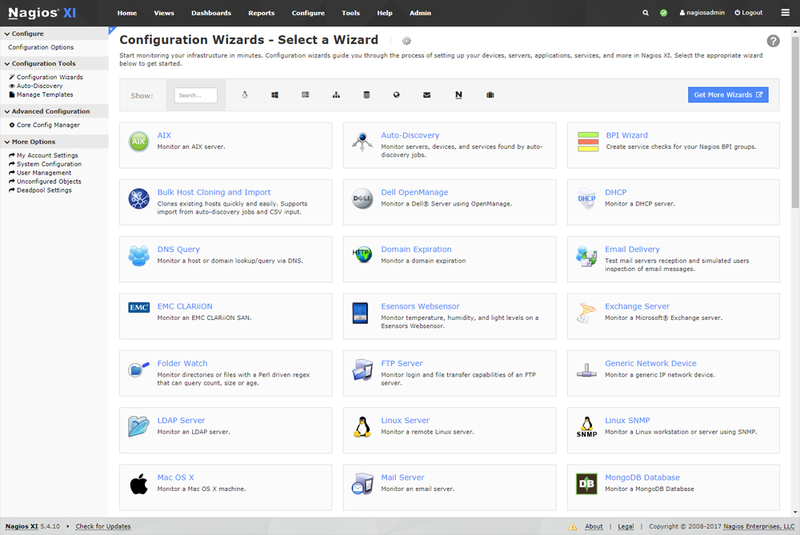 Configuration Wizards Fast Wizards! Simply enter the required information, and you’re up and monitoring with a few simple clicks. 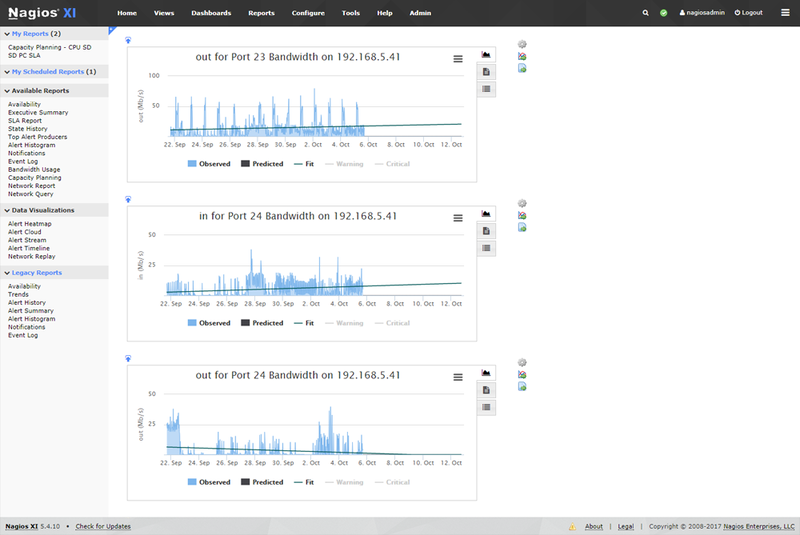 Infrastructure Management Improved Bulk Host Import, Autodiscovery, Auto Decommissioning, Mass Acknowledgment & much more! 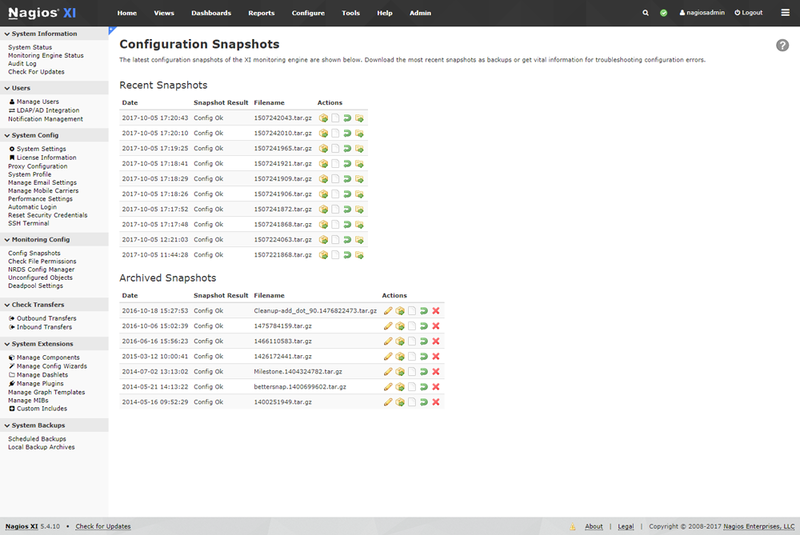 Configuration Snapshot Save your most recent configurations. Archive it. Revert back whenever you like. Never lose it again. Relax. Advanced User Management Easily setup and manage user accounts with only a few clicks then assign custom roles to ensure a secure environment. These figures represent the minimum requirements to run Nagios XI. To view more detailed guidelines view our hardware requirements PDF. Nagios XI is available in multiple different license levels: 100 Node through Unlimited Node. A node is anything with an IP address or domain that you would like to monitor (switches, routers, firewalls, workstations, and other network devices). There are no restrictions on the number of services that can be monitored. Each license includes twelve months of maintenance (upgrade entitlements) and email support. Nagios XI is available in two different editions: Standard Edition and an Enterprise Edition. The Enterprise Edition provides users with additional functionality and includes features that are designed to aid in large-scale configuration, forecasting, and scheduled reporting. Each license includes twelve months of maintenance (upgrade entitlements) and email support. *Note: Enterprise Edition licenses require annual renewal of Maintenance & Support - or - Maintenance-Only contract. Already have Nagios XI and looking to renew? View our renewal plans. How is Nagios XI licensed? Learn more about Nagios XI license levels. Is there a free edition of Nagios XI? Yes! 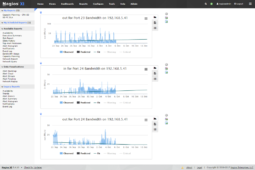 Nagios XI is available free of charge for monitoring small environments. Nagios XI installations with a free license are limited to monitoring seven (7) hosts (nodes). There is no limitation on the number of services that can be monitored with a free license. Students may qualify for increased or unrestricted monitoring limits based on their needs and qualifications. Download Nagios XI and try it for free. What support options are available for Nagios XI? Nagios XI is supported by our team of professionals. Forum and email support are included in the base license price for Nagios XI. 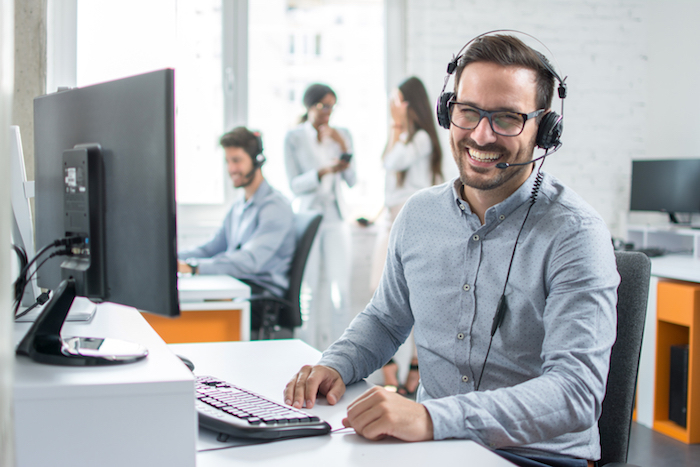 Optional phone support contracts are available to customers who require additional support services. Can Nagios XI be deployed to physical servers? Yes! We distribute Nagios XI as a virtual machine to ensure you get it up and running quickly. Manual installation is possible to physical servers running RHEL or CentOS and is available to customers that require it. Can my Nagios Core installation be migrated to Nagios XI? Yes! Migrating both standalone and distributed Nagios Core environments to Nagios XI is possible. Contact us if you would like professional assistance with migration. Can I use custom and community add-ons with Nagios XI? Yes! Nagios XI is designed with extensibility in mind. Because it uses Nagios Core as a monitoring engine, you can use your custom Nagios plugins and event handlers, as well as community add-ons to extend XI’s native functionality. Discover thousands of plugins for Nagios XI at the Nagios Exchange! 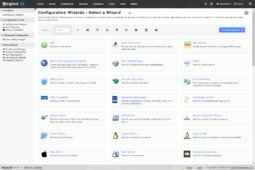 Are Nagios XI components available as open source? Yes! 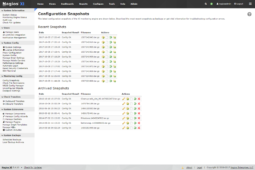 Many of our plugins and add-ons can work with either Nagios XI or Nagios Core and are released under an OSS license. What does Nagios XI mean for the Nagios Core Project? We think it means really great things for the long run. First, we’re dedicated to maintaining and developing Nagios Core for the long term. Ethan Galstad – original creator and “Father” of Nagios – is actively involved in the design and development of XI and knows that its long-term success depends on a solid foundation of proven, Open Source components like Nagios Core. We believe Nagios XI benefits the Open Source project by providing increased resources and further improvements in terms of scalability and extensibility. 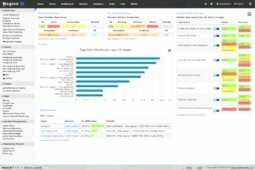 Nagios is more than just the OSS monitoring core – it’s an entire ecosystem of thousands of add-ons, extensions, and contributors worldwide. We will continue to further expand and contribute to the community as the result of our work with Nagios XI and our customers. 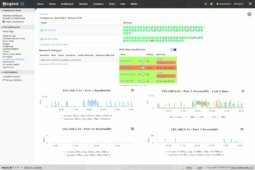 What's the difference between Nagios XI Standard Edition and Nagios XI Enterprise Edition? View a chart comparing Nagios Standard Edition to Nagios Enterprise Edition. Are there any additional costs for a test or back-up installation of Nagios XI? No! When purchasing a single license of Nagios XI, we provide you with three separate installs: one for production, one for back-up/failover, and one for testing/development. How do I achieve High Availability (HA) with Nagios XI? Each Nagios XI license includes one production, one backup/failover, and one testing/development install. This allows for an active-passive failover model, but if you would like to have an active-active setup then you would need one license for each system. Can I upgrade or downgrade my license after purchase if needed? When purchasing a Nagios XI license, you always have the option to upgrade or downgrade your license level. If you are upgrading you just pay the pricing difference between your current license and the one you’d like to upgrade to. If it is close to renewal time when you choose to upgrade or downgrade you can simply pay the support and maintenance renewal rate for the new level license.